And sometimes, for me, it takes forever. My last post on this project was dated June 2017. I’m not even kidding. Here it is. And, if you’re wondering…I’m still working on it. In fairness, I have a tendency to put a project away for a couple of years, and then come back to it with gusto. This is one of those projects. I am determined to finish it before the end of the summer. I love hand work, and find it very relaxing. And it’s time for this one to move along. I’ve made progress, just not enough. I do have a couple more tips for you, if you are working with wool. Remember I said to use a longarm stapler to hold your pieces in place? ( I did.) Well, I’d like to add to that. Use it GENEROUSLY. See all those staples? They really do help keep things from wandering while you stitch. They leave no mark, they are easy, convenient and not a big deal to pull out. I love it. 2. Try these little leather patches. I have a weird way of using my ring finger to push the needle. Thimbles are so cumbersome, even the leather thimbles. 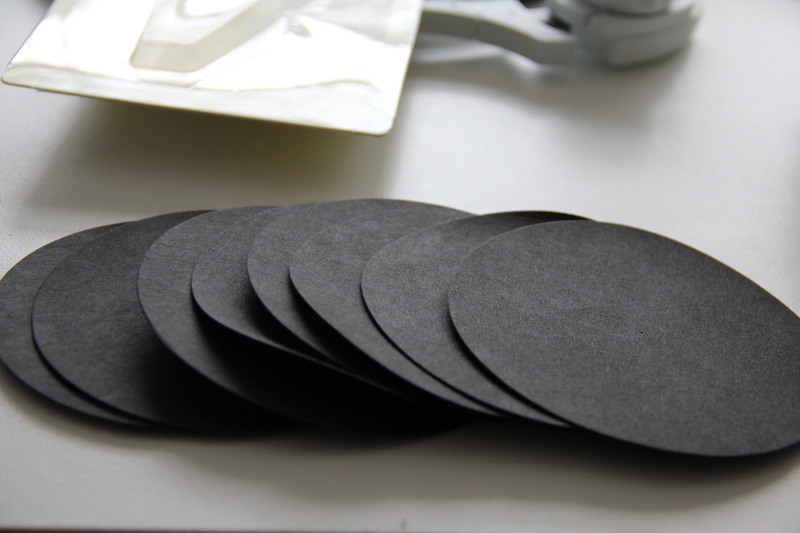 But these little patches can actually be used and reused so that a single pack of them can last a long time. I can use one patch for weeks. I just peel it off and stick it back into it’s packaging or on the plastic covering, and peel it off again to reuse it the next time. They are perfect when hand sewing quilt bindings, or doing any kind of handwork. Most of us have one finger we use consistently to push the needle. This leaves your finger mostly free except for the exact spot that gets the pressure. 3. Try using a wool pattern in a different color way. Along the way to finishing the project above, I did a whole other project where I added some wool to a cotton wall hanging. The aquas, golds and greens in this pattern were a fun interpretation of the same floral design. Valdani cotton is my preferred thread for hand work. I have purchased directly from them, but you can find local shops who carry it. If your quilt shop doesn’t, be sure to ask them to start carrying it. You are likely not the only one who would like to see it. I have lots of other projects up my sleeve coming soon, but this wool project is one I’d like to see completed. Wish me luck and perseverance. May you find time for all your long term projects too. They teach us that life is short, and we need to keep stitching. I’ve been sewing, I promise. Just not as much as I would like. But here’s a little peak at the hyacinth that have started popping up in my backyard. We all need a bit of the wild earth to sweep us away every now and then. For me, that happens in the spring and summer when the light and the blooms blend into tiny miracles. The closer I look, the more miraculous it all seems. 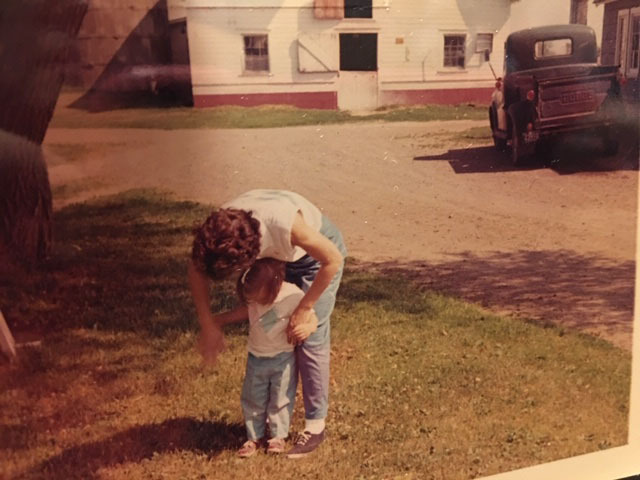 I’ve been in a flurry of personal sewing gifts for milestone birthdays, so I have not taken the time to update the blog til now. I thought I would just include a gallery of projects. The quilt that I just raced through was a pattern from Modern Quilt Studio. If you haven’t figured it out by now, they are one of my favorites, as Weeks Ringle and Bill Kerr are both artists with graphic backgrounds and an instinct for color and design. I have great respect for them both. I recognize the talent that feeds into what comes across as simplicity. This takes work and artistry and they have both. If you have the chance to see either of them in person, you won’t regret it and I promise you will come away smarter and more confident in your craft. More importantly, they were modern quilt artists before it was cool. One of the first quilting books I ever purchased was theirs and I haven’t looked back since. I hope you are “springing ahead” with your sewing, as I am with mine. While I have some fabric already available for my next quilt, I also want to try something completely different. That’s the fun of it all, isn’t it? We get to try new things all the time. Stay warm and keep stitching! I know I’m getting ahead of the game, thinking about Easter. But I felt like I needed a bit of Easter cheer early on, so these are what I found. Do you have an embroidery unit you haven’t taken out of the box? (You know who you are, my friends.) This is about as simple a project as you can imagine. Here’s a link to the designs. Just download them onto a USB stick. Prepare some fabric…you only really need scraps. And find some scrap batting. You know, the stuff you cut off around the edges of your last quilt. 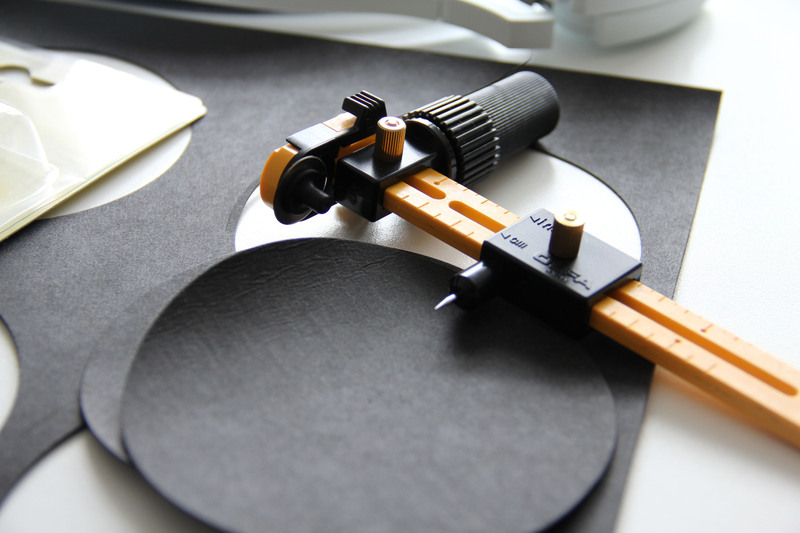 Tip: After cutting small amounts of batting on your cutting mat, use a lint remover to clean up the batting. Here’s the trickiest part. You need a nylon zipper. At least 7 inches. These are unbelievably common in the sewing world. Anything over 7 inches will work. And here’s a bonus. If you purchase her zipper pulls, you can easily change the color of the pull. Here’s instructions on how to do that. Your life will never be the same. Back to the Easter egg pouches. I’m sure they come with instructions but I never read them. (Surprise, surprise.) Take some scraps of batting, approx, 6 inches x 6 inches, along with some scraps of fabric, about 6 inches x 12 inches. You’ll need 2 of the smaller size for the top and bottom half of your egg, a larger quilt sandwich for the backing/lining. Wrap the smaller size fabric around the batting, so you have a straight edge to lay against the fold. As you can see here, I didn’t even cut my scraps with any precision, as they will be completely trimmed away. You are just making sure that the batting is covered front and back. The fabric shown is Modern Quilt Studio’s Dot Crazy. I love this because it has fabric with a line of larger dots through the center…no piecing necessary. Hoop your large oval or any 5 x 7 or larger hoop with sticky back tearaway stabilizer. I used OESD Stabilstick tearaway. The design will walk you through all the steps on your machine. The first stitch out will be the placement line for the zip, which stitches directly onto the stabilizer. Then stitch down lines on the zipper, then you lay down the top part of the egg with the fold right up to the zipper. The design will then stitch across the top fabric on the zipper. The goal is to make sure you have enough fabric wrapped around the batting to cover both sides of the egg. Next, it will stitch the top half of the egg down. Then lay your bottom fabric with the fold up against the zipper, as you did with the top. The next stitch will secure the bottom fabric to the zipper, and the stitch after that will secure the bottom half of the egg. Move your zipper pull to the middle of the design! This will allow you to turn the pouch inside out once it has been stitched. Now, you can also add a ribbon or handle at the top before the backing/lining is stitched down. (As I did). Add a quilt sandwich with the backing and lining down on top. The final stitch is a zigzag to secure the seams. This entire stitch out is a total of 6 minutes–almost as long as it take to read this blog post. 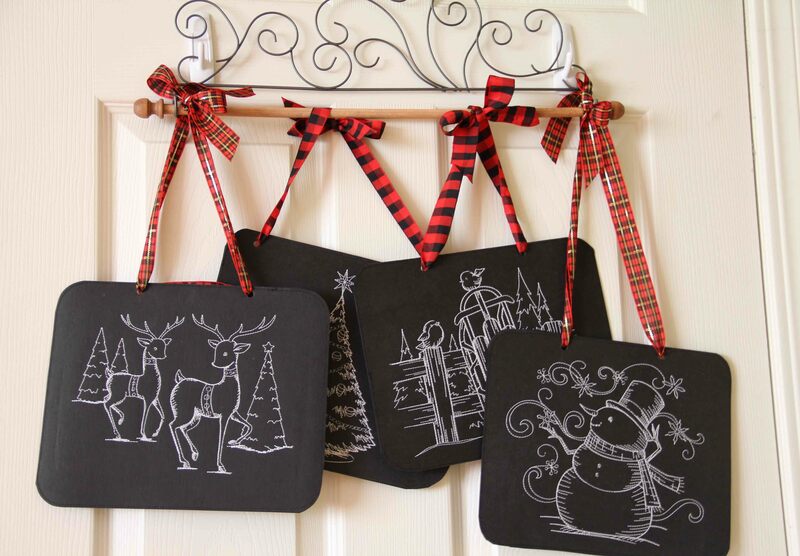 These are easy and really quick, using fabric and scraps you likely have lying around. When you take it out of the hoop, trim close to the stitching. Remove the stabilizer from around the zipper, and then open the zipper as far as you can. This will help when you turn the bag inside out. Remove as much of the stabilizer on the rest of the bag as possible. You should only see a bit of stabilizer around the outside seam, and a tiny bit where the zipper is attached. Everything else can be removed. Turn your little egg inside out and press. Use your egg pockets as decorations or gifts–a great gift card holder or candy pouch! Now reward yourself with fine chocolate. Valentine’s Day is coming after all. Whatever your style, whatever your favorites, 2019 is turning into a year of bodacious color. I’m a trend-geek and I’m always interested in what the “experts” consider to be the next big thing. As you can imagine, 2019 holds a lot of possibilities, from Artificial Intelligence to Augmented Reality to graphic design with the most vibrant knock-’em-dead colors available. I won’t go into my newly formed relationship with my Roomba named Sean. I freely admit that I am not an early adopter when it comes to technology. I like to let someone else work out the bugs. But if you ever want to know about the joys of a Roomba, let me know. I am thrilled. And I don’t even mind that my scale talks to my Fitbit, and my vacuum cleaner texts me regularly. Give me an electronic slave that cleans the toilets and I will have dinner with it afterward, if that’s what it takes. What will affect us in the sewing world? Pantone has declared a new color for 2019 (they choose one every year.) This one is called Living Coral. I love it. What influence will it have on fashion design and fabric? Well, for them to choose this color, they already know what the runways are planning. Pantone does their research to predict this color. So we can be sure to see more of it come spring. Here’s a link to some palette possibilities. As I look at them, I can see that the combinations would make great quilts. So there’s something to explore. And it all looks quite fresh to me. Sometimes I find that the fabric in my stash just looks dated, but add in a few new colors and you can really brighten up, freshen up, and lighten up your color combinations. I’ve been working on a quilt with some bold colors and a very simple design. But the quilt was more difficult to put together than it looks. I was working with a line called Warp and Weft from Modern Quilt Studio. It is a line of wovens that they designed to have a stronger weave than the average woven. And the colors were fun. However, I had to pull out a few of the fatquarters from the bundle because they just dragged down the whole palette. I’m not critical of the colors. These are perfectly lovely fabrics. They just absolutely did not work in the quilt. The charcoal was too dark and would have created “holes” in the quilt. The buffalo print was just too busy and neutral, and the pink really greyed down the look of the whole quilt. It took some fussing to get something that looked effortless. The second challenge was to lay it out with contrasting colors next to one another. That was key to the whole look. This quilt will be quilted at a friend’s house on her longarm. It will be a collaboration and I am not tied to any particular style of quilting, as long as we all learn something in the process. I think it will be fun. In these dreary mid-winter days, I encourage you to embark on your own color adventure. It’s fun, it’s cheerful and you may find yourself exploring something new. When folks ask me about quilting on their home machine, my go-to answer has always been: You’ll probably be OK with anything up to a twin size quilt. After that, it just gets unmanageable. And, overall, I stand by that recommendation. Surround yourself with supportive tables and ideally a sewing machine cabinet designed for quilting. As you can see above. I have a fairly large quilt table to support the weight of the quilt as it gets moved around. It doesn’t hurt to have a a cabinet that allows your machine to sink down level with the table. 2. I always use gloves. And this has a lot to do with personal preference. Some people get too hot in their hands, and I can understand that. But I love Machingers, as they are lightweight, fit my hands, and are machine washable. 3. Do 1/4 of the quilt at a time. This way, you’ll never have more than half the quilt shoved up against the machine at one time. And I do mean shoved. 4. Avoid rolling your quilt. It’s simply impossible to do any type of freeform quilting with a giant roll on your right. Any good quilter will tell you to just bunch it up and straighten as you go. 5. Quilt from the center to the outside, always moving fabric away from your machine. Even as I type this, I recognize that there are times when you are moving up or down on the quilt and even occasionally in the wrong direction. That’s fine. As long as OVERALL, your are moving from middle to your right edge. That’s the beauty of working on a quarter of the quilt at one time. Once a quarter is done, spin your quilt 90 degrees (a quarter of a revolution), allowing you to work on the next quarter. Does that make sense? 6. Keep your quilting simple. Save the gorgeous, ornate, custom, refined work for the longarm. Or make yourself an expert on this with LOTS of practice. I don’t consider myself an expert yet on quilting a large quilt. It’s an awful lot of heft to shift around elegantly. I’d rather use machine embroidery for a more complicated design. But remember this: you are only working on about a dinner plate size area at any given time. After that is done, you need to shift your hands and the quilt. As always with this hobby, if you’re not enjoying yourself, or are afraid to ruin something, then it is just advisable to pay someone to do your quilting. If, though, like me, you prefer to have a quilt that’s all “your own”, then don’t be afraid to try some things. On the queen size quilt above, I knew that once it was washed, all I really wanted was that old-fashioned scrunchy, quilty look. I did some small/medium-sized stippling, with straight line quilting on the outer border of half square triangles. I threw it in the washing machine and all sins were forgiven. All that’s left to do is the label, which I’m hoping to squeeze in before the end of 2018, so I can declare this one FINISHED. And as we all know, finished is better than perfect….though I am loving the way this came out, and my teenage son has already claimed it. Have a Happy New Year and a wonderful and productive 2019! My next project is much more carefree and colorful. Here’s a sneak peak. Happy Stitching–a sewing machine, a glass of champagne and a bit of chocolate would be a perfect way to start the new year. #SNOWVEMBER, is what I’m told. Actually, it’s just raining. but they say the snow is coming…and plenty of it. I am skeptical, but that’s nothing new. 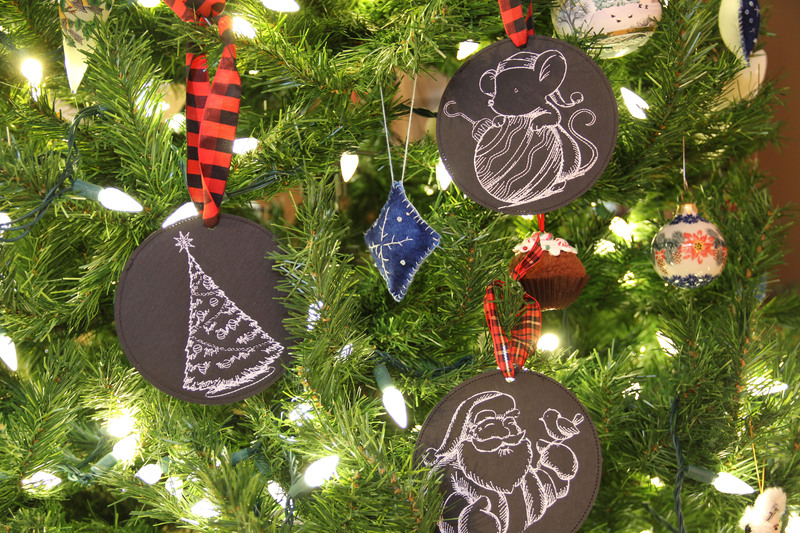 These little ornaments on the tree are made from Kraft Tex. (See my previous post for more details.) I think they turned out cute, and I am anxious to try stitching them out on fabric and turning them into little stuffed ornaments. I think that would be adorable. These have designs on both sides, because I just wanted some flexibility. I’ll need to make some minor adjustments to the software file I use to stitch out the designs on fabric. On the new ones, I’ll add a seam around the outside, leaving an opening to turn them. Then it will be just a matter of stuffing them. I’ll share when I start that. But for this task, I wanted to show you the greatest little tool I got at the shop as it was closing. I didn’t think I’d ever need it, didn’t really have any idea why I might use it, but of course I purchased it anyway. And it sat in my sewing room for over a year. It’s called a Circle Rotary Cutter from Olfa. I finally decided to try it out for this project and I am in love with it. I guess I just didn’t know how desperately I needed to cut accurate circles. It has a ruler attached so you can set the radius. You basically use it like a compass, with the sharp point in the center, and a blade instead of a pencil at the end. Suddenly I am imagining all the wool projects I’d like to invent using circles, as well as paper, Kraft Tex, felt, and basically anything a rotary cutter will go through. In minutes I had beautiful, ACCURATE circles. Do not discount the significance of getting a circle perfectly round. I am off now, to work on a quick quilt that I must finish before the holidays. We all have those last minute projects. For those of you in the Midwest, Happy Blizzard-Sewing! C’mon. You know you’ve seen this truck everywhere. I’m not sure when it became the definitive retro/vintage/holiday symbol. But somewhere along the way it did. I’ve seen it in catalogs, in charming shops, on TV (Hallmark Channel has at least one movie where the truck is a co-star.) I’m sure this old truck obsession is a simple longing for tradition, simplicity, home-baked cookies and the scent of actual pine. But let’s remember: this cute, sentimental old truck could put out enough dangerous fumes to choke a horse pulling an open sleigh. We are excellent at suspending reality during the holidays. 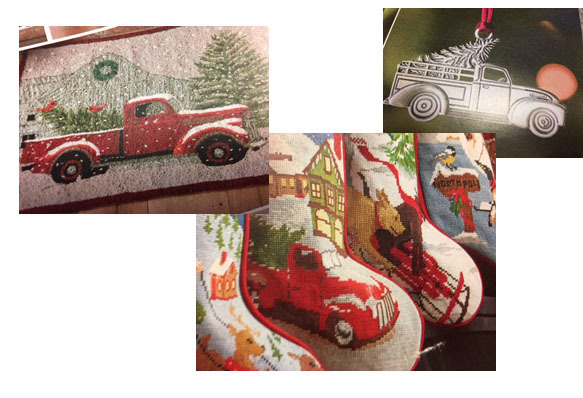 Since I’m as sentimental as everybody else around the holidays, I found myself purchasing the truck machine embroidery shown at the top. Buy it here. 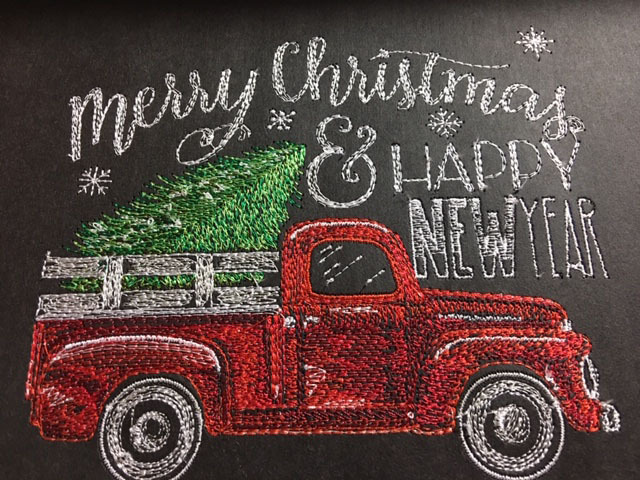 I stitched it out on Kraft Tex. If you’re not familiar with Kraft Tex, it’s the miracle textile that the Levi’s logo is made of. It doesn’t rip. It’s washable. It lasts forever and takes a beating and doesn’t show wear and tear. And you can sew with it and on it. I wasn’t sure how it would hold up with 22,000 stitches on it, but I used Stabilstick Cutaway stabilizer and it was perfect. 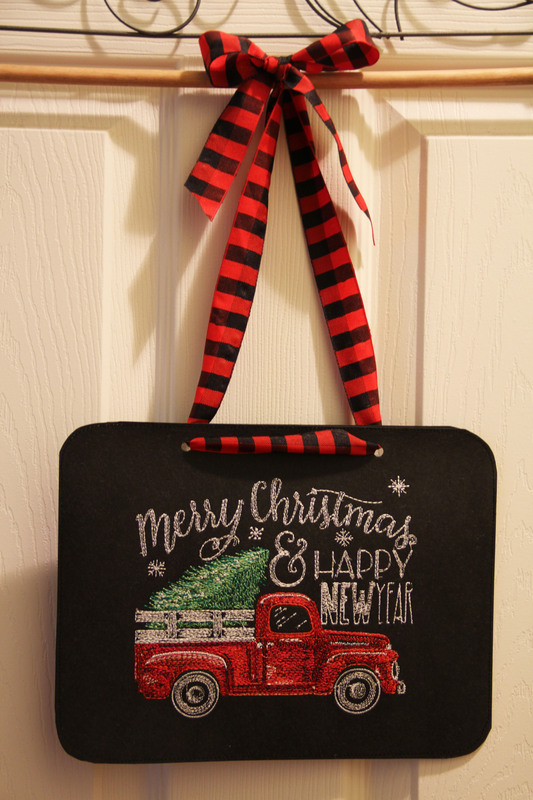 Then I started getting more ideas about holiday decor using Kraft Tex and machine embroidery. 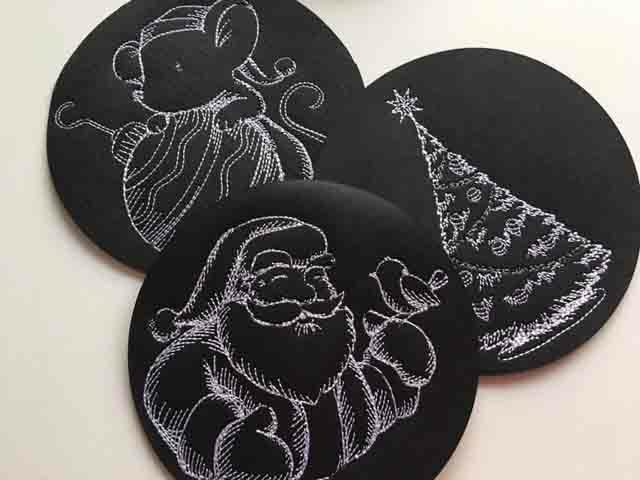 You can find some cute and simple designs here. I stitched them out, again using the Stabilstick cutaway stabilizer. I put a design on the front and on the back, trimmed them to size, rounded the corners, and stitched in black around the outside. They are the perfect shape for mouse pads. But I added ribbon and will give them out on Thanksgiving as a holiday decoration. Once I did those, I started testing ornaments. CAUTION: Don’t just resize the designs. Yuck. Big mistake. So I went back to the website and ordered some new ones in smaller original sizes. These turned out just fine. 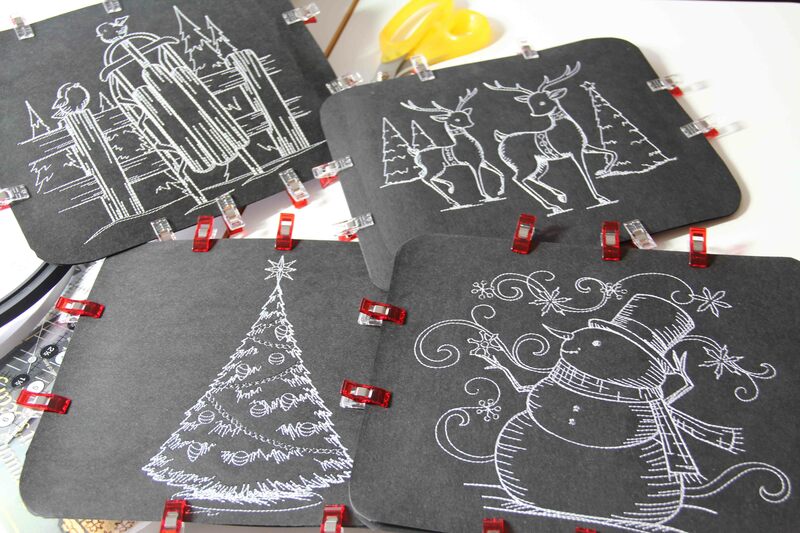 I’ll be adding ribbon and using them as ornaments. They will have different designs on each side. I’ll share more when I get them completed. For now, I’m wishing all of you a wonderful Thanksgiving and a relaxing weekend with loved ones. My holiday will be spent with 10 close family members and 2 dogs. That’s charming and sentimental enough for me. I found this cute embroidery in Cross Stitch Magazine, Halloween edition. I am not someone who is into cross stitch, but I think it looks so charming around the holidays. My way of handling this is to digitize it and then use the machine to embroider it. 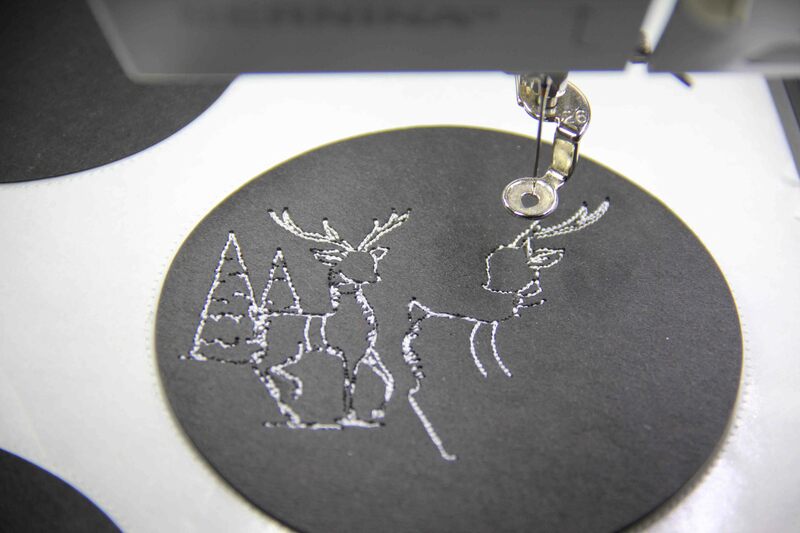 I use Bernina Embroidery Software 8, which has a cross stitch application within the program. If you are not familiar with it, the sub-program has its own “help” section and manual. I find that it is really pretty simple if you know a few basics. I will share with you what I did to create this design, and you can explore another of my Halloween posts right here. The first step is to scan the pattern at its original size. This design was approximately 7.5 in. x 6 in. Shown above is the black and white scan of the image, but you can see that this image is enlarged enough to show that I can see the markings of all the different thread colors. That will be important later when I manually add them. Crop the image right up to the outline of the grid. You want it to be cropped as perfectly as possible when you load it into the cross stitch program. I use Adobe Photoshop to do this, but Corel is built into the software program and you can easily use that instead. Count the grid. The heavy lines indicate ten spaces, so you can get an accurate count. You’ll need that later. Open the cross stitch program in applications. Click the “picture” tab and load the picture. Right click on the picture (this is an important step!) and plug the dimensions of the grid in the width and height. These are the number of grid boxes you counted in the second step. This aligns your image with the grid in the program. Begin adding in your stitches by clicking on the pencil. At the bottom you can choose the type of stitch…I almost always use a full cross, but you have a number of options. Choose a color, and you’re ready to fill in your stitches using the image as your guide. Left click on each grid box to add in your stitches. In the image above, you can see what it looks like after I added all the stitches. This did not take long at all, maybe half an hour to get them all filled in. Save the file as filename.arx. .arx is the extension used by the cross stitch program. Now you can close the whole cross stitch program and your embroidery software will still be open. When opening this file, just be sure to choose the .arx extension or “All Files”. This is the great part. The software will digitze those cross stitches and turn the whole design into an embroidery file. Above, you can see how it turned out on my screen. I exported it then as .exp as I would any embroidery design file and saved it on a usb stick. The first time I stitched it out, the ghost in the background was just a little too faded. I switched to a slightly darker fabric and the ghost appears more clearly on the right (although I think the picture is a little fooled by the lighting.) In real life (!) the one on the right lets the ghost show up much better. I had fun with this project and it’s actually a lot less time consuming than cross stitching by hand — though I have great appreciation for those who do that! 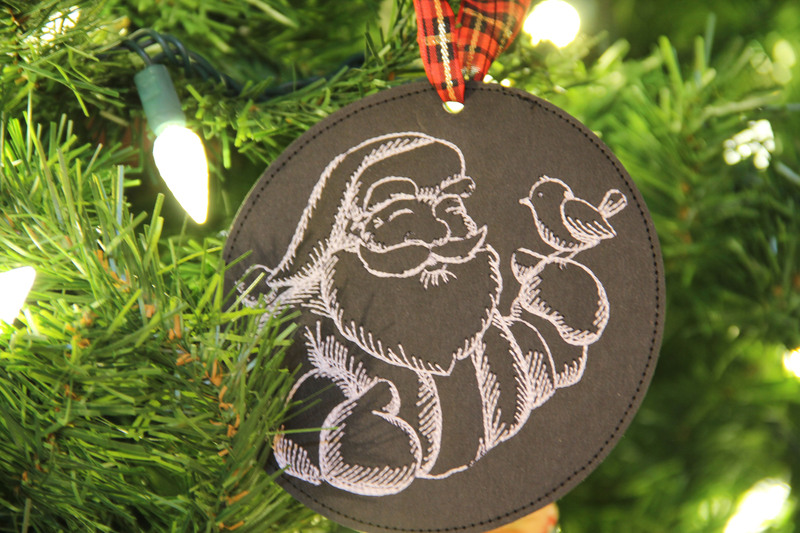 This way, I can stitch it out over and over again…on a pillow, as an ornament, on a bag, etc. I used Isacord thread for these, which is 40 weight embroidery thread. But I am curious how it would turn out if I had done it with 28 weight, a heavier weight thread. I think that would be really sharp. The cross stitch program would allow me to adjust the size of the grid as well, so I have lots of opportunity to go deeper and try new things. Hope this inspires you. The cost of one magazine provides you with so many cute patterns to try. And cross stitch is a program that is so often overlooked in digitizing software. It’s really worth some experimentation.